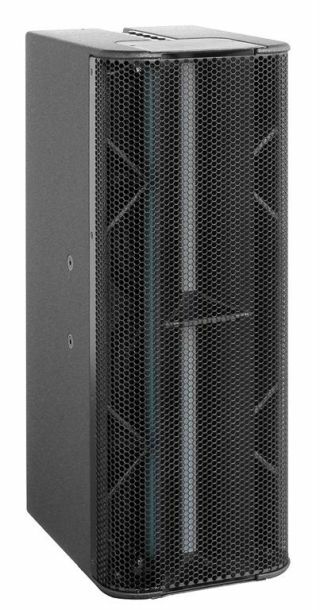 Following the success of the Q-series, Alcons Audio has introduced the QR24 line-source array column: a modular 2-way column loudspeaker to be used as vertical array system, for both permanent and (limited) portable applications. Due to its modularity, throw and low-frequency directivity (“near field”) can be increased just by extending the array length; multiple individual mid-high frequency lobes can be made, by using the QM low-mid fill columns. The QR24 measures a mere 66cm / 26-inch tall in length, and is fitted with 4x 6.5-inch woofers and two purpose-built 12-inch pro-ribbon drivers; specifically for this system, the “RBN03” pro-ribbon platform was developed, offering Alcons’ non-compressed HiFi sound quality with absolute lowest distortion possible, but with less mounting depth. This accommodates a co-axial driver arrangement with the LMF transducers, which are, at the same time, actively cooling the RBN drivers for further power compression reduction. By using only two 12-inch RBN drivers, the system’s active frontal radiation is close to 90 percent; the resulting sharply-controlled vertical dispersion offers a SPL-independent, intelligibility over distance, without the necessity of DSP-based beam-shaping. The symmetrical acoustic design, in combination with the patented horizontal dispersion of the RBN HF drivers, offers a coherent horizontal pattern control with seamless coverage, the company says. This widens the “stereo sweet spot” significantly, for the off-axis positioned audience. The projection pattern in the horizontal / non-coupling plane is 80-degrees (-6dB) and in the vertical / coupling plane, it is 6-degrees (single column). Each purpose-designed 12-inch RBN driver has a peak power handling of 2.000W (200 msec), creating a virtually infinite system headroom of 4.000W from 1kHz up. Together with the high acoustical sensitivity, the system enables high-SPL sound-reinforcement performance. The frequency response is -3dB flat between 74Hz. to 20.000Hz, to easily match a accompanying subwoofer system, catering for a relatively simple bi-amped, three-way system. The flat frequency response and the fast transient response of the RBN mid-high frequency transducers, in combination with the sharply controlled dispersion, brings a maximum “gain-before-feedback” up to directly in front of / under the system. The passive filtering allows up to three QR24 modules to be combined on one amplifier channel, with an array length of 2-meters/7-feet.